Datura is a variable group of plants. Datura are herbaceous annuals and short-lived perennials in the tomato family (Solanaceae) with a confused taxonomy and disputed origin because of their extensive naturalization through temperate and tropical regions world-wide. Of the eight or nine species in the genus Datura, many naturally exhibit extreme variability in foliar and floral characteristics and many are very similar in appearance. Depending on the conditions a plant is growing under, the size of the plant, leaves and flowers can range from very large to very small – which has led to many “new species” being described that are later found to be simply variations that developed in different locations due to the conditions. Even one of its common names, angels’s trumpet, is confusing as that is also used for the closely related genus Brugmansia, a South American group differs that from the genus Datura by having woody stems, pendant flowers and seed pods that need to be broken open. 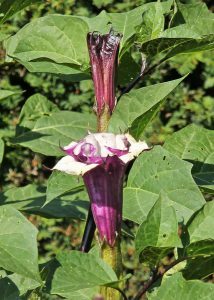 Other common names for the genus include devil’s trumpets, moonflowers, and thorn-apple, with the name jimsonweed referring to D. stramonium (a common weed in pastures, roadsides and waste places throughout much of the world including the US and southern Canada) and horn-of-plenty applied to D. metel. 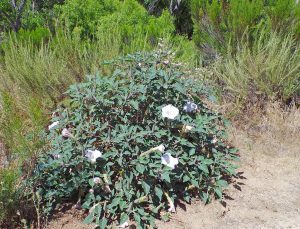 Datura growing wild in Southern California. The greatest diversity of species occurs in Central America and Mexico, suggesting this as the origin of the genus, but there is ample evidence that these plants were used culturally both in the New World and in Asia as sacred plants for many millennia (at least 3,000 years) for their power to induce visionary dreams. 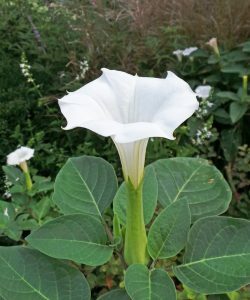 All Datura plants contain a number of alkaloids, especially in the seeds and flowers, that are toxic, narcotic and hallucinogenic. The toxicity depends on the age of the plant and growing conditions, making the use of the plants as recreational drugs (and even for medicinal or religious use in traditional cultures) very hazardous, with serious illness or death a possibility from accidental or intentional ingestion. They are also poisonous to cattle, horses and sheep. The cultivation of Datura is banned in some states and municipalities. An ornamental cultivar of D. metel. 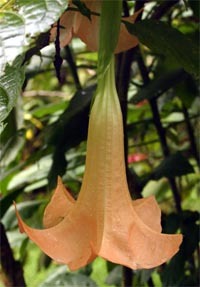 Of the nine species of Datura, only two of these herbaceous annuals/tender perennials are commonly used as ornamentals. D. inoxia, native to Central America, Mexico and the southwestern US, is the most common, along with D. metel, native to southeast Asia. The weedier D. stramonium, native to North America with smaller flowers and tooth-edged leaves, is occasionally offered as an ornamental. Even the tender perennials are fast-growing so are easily grown as seasonal annuals from seed in the Midwest. These shrubby, sprawling warm season plants tend to grow fairly large in a single growing season. D. metel has a mounded habit and can grow 2-3 feet tall and at least as wide, if not up to twice as wide under ideal conditions and a long growing season. D. stramonium generally gets 3-4 feet tall and wide, but often flops under its own weight. D. inoxia has a more upright habit with a regular branching pattern and can get up to 5 feet tall. The gray-green to dark green alternate leaves up to 10 inches long and 4 inches wide have a lobed or toothed margin. Their surfaces are either smooth (D. metel in most cases and D. stramonium) or downy (D. inoxia). The coarse-textured foliage is foul smelling when handled and the sap can cause a skin rash in sensitive individuals. Datura plants are shrubby and spreading (L) with leaves that vary in color from medium green to gray-green and with entire to lobed or toothed margins (C and R). The large, erect, trumpet-shaped flowers range in color from pure white to pinkish purple, but some species have flowers that are bright golden yellow or red-purple, and some have double or triple blooms. The petals are fused to form a funnel with 5 or 10 lobes. The furled, cigar-shaped flower buds unwind after dusk (vespertine) and the flowers remain open until about noon of the following day when the petals begin to decline. The flowers exude a pleasant honeysuckle-like scent, especially at night, which attracts night-flying sphinx moths which are their primary pollinators. The flowers may also be visited by honey bees and other insects. Plants bloom continuously from summer until frost. Erect cigar-shaped flower buds (L) open at the tip (LC) to unfurl (C) to an erect trumpet-shaped bloom (RC). Flowers range in color from pure white to pinkish purple (RC). Flowers are followed by rounded fruits that are walnut-sized capsules that are knobby (D. metel) or covered with sharp and spiky spines at maturity (D. inoxia and D. stramonium). The capsules split open when ripe to release the numerous flattened tan or brown seeds that are similar in appearance to stout tomato seeds. Unless the seed capsules are removed before maturity, the plants tend to self-seed and can become invasive. Seeds remain viable for years. Fruits are rounded capsules (L and LC) that split open when ripe (C) to release the numerous seeds (RC and R). 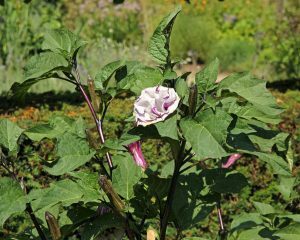 The large, coarse foliage of datura contrasts well with many other plants with fine or medium texture. Daturas tend to be large, sprawling plants with a coarse texture, so they are best suited as specimen or background plants in mixed or annual plantings. If possible, place them where the fragrance of the dramatic flowers may be enjoyed. Those with white flowers are a natural choice for the moon garden as they are most fragrant in the evening. The bold foliage contrasts well with short ornamental grasses (such as shorter annual or perennial Pennisetums or ruby grass) and annuals with fine or medium foliage and lots of flowers, such as Profusion series zinnias or petunias. 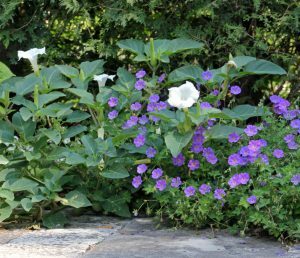 The large white flowers are ideal for moon gardens. 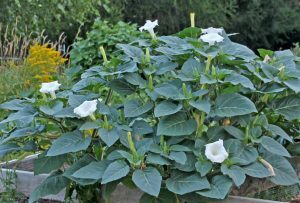 Grow datura in full sun and well-drained soil (it will grow in partial shade, but will be leggier and have fewer flowers). 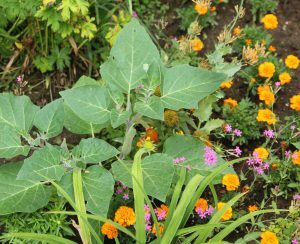 It is drought tolerant once established and thrives in almost any type of soil, but the plants are most impressive when grown in humus-rich loam with regular moisture. Datura grows quickly and needs plenty of room. They need plenty of room and will quickly grow to fill an area of several feet once the weather gets hot so place them accordingly. They may be grow from seed sown outdoors after the last frost or started indoors 6-8 weeks before the average date of last frost and planted outdoors after all threat of frost has passed (and after acclimating the young plants to outdoor conditions). Datura grows quickly from seed, often in dense groups when self-sown (L), producing narrow cotyledons (LC) and then rounded leaves (RC and R). Although they can be grown in large containers, they are generally best grown in the ground because of their size. 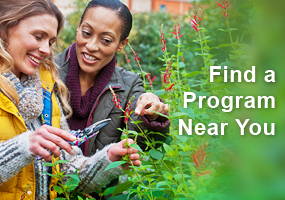 They rarely need pruning, although stems can be cut back to shape the plants. Staking may be necessary for some plants. 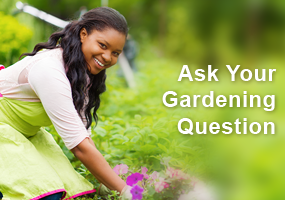 They have almost no pest problems, but may be infested with whiteflies, mealybugs and spider mites. D. inoxia ‘Missouri Marble’ has variegated foliage (tinted pink with white margins), purple stems, and white and violet-purple mottled flowers that may be single or double. D. metel ‘Aurea’ has yellow flowers. D. metel Ballerina Series has swirled flowers in shades of purple, yellow and white on more compact plants. ‘Black Currant Swirl’ (and other names including ‘Double Purple’ and ‘Purple Hindu’) is a double or triple hybrid or variety of D. metel with flowers that are dark purple on the outside and white inside that remain open during the day but are not very fragrant. D. metel ‘Flore Pleno’ has double white flowers. Golden Queen’ is a hybrid with double, lemon-yellow frilled flowers. I had this plant in my front walk which received eadt sun quite a few years back but decided to move it to the west side and it did not survive. I will try again this year farther into the garden on the south side. I don’t have pets or young children so am more comfortable concerning for toxity issue. Very interesting article on this plant. 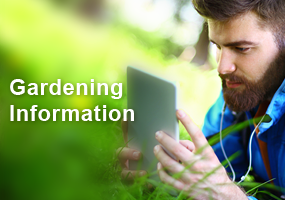 A dangerous plant but with education it can be a beautiful addition in the right environment. What a beautiful plant. I never knew much about this plant. The history and the fact that it is very toxic. I am debating if I should try it. I love the dramtic flowers and have grown this plant as a container plant in the past. I knew it was very toxic and made sure to place it out of the way of little people and pets. Very interesting about the origin of this plant. Interesting facts on the origin of this plant. I knew it was very toxic but I have grown it as a container plant several different times. I love the dramitic flowers. Interesting to learn that the flowers come in such a wide array of hues. Attracting the night flying sphinx moth would be great addition to our garden. Nice to know that neighboring honey bees would also find source of food throughout the summer and right up to frost. The toxicity concerns me, also, I did not see any reference to these being pollinators for butterflies/also, might they attract hummingbird? I was surprised at how many varieties of this flower there are and how large some of them spread to be. Kind of neat to know they are part of the tomato family. Since I rarely see these in local nurseries, is there a recommendation for the cultivar that would grow best in light shade in a container? What an interesting group of plants. They look lovely, but I think I would be hesitant to grow them or recommend them out if concerns of the toxicity…. Interesting article on the different cultivars of datura. I happen to have the white one that is in my garden. I will gather pods in the fall and sprinkle them in an area that I would like some nice foliage with white flowers. Love that they bloom till frost. Yes, they do spread and are in places you might not want them but they are pretty. I would recommend them to have in your garden. They grow fast and they are easy to grow. Enjoy!! Clear information explaining the genus and good photos, thank you. Disappointed. Starting reading this article thinking “I have just the spot for that.” Changed my mind. Love the dramatic flower shape, but the potential toxicity of injested seeds and flowers makes them undesirable. If that’s not deterrent enough, even the sap from foliage can cause a rash on sensitive skin. I love that they will quickly fill in an area and am excited to try this plant this coming year! I have a moon garden so the white variety will fit right in. I learned that Datura is a candidate for inclusion in a Moon Garden. This sounds interesting; however I’ll have to learn something about the why and how of planting one. Interesting to learn that this plant has “the power to induce visionary dreams”. I planted this a few years ago in a large pot. The only info on the tag I had said full sun and nothing about size…It did bloom and was very fragrant! Now I will try it in the ground and let it sprawl along with fountain grass and zinnias. I received a packet of Datura seeds from another master gardener, but did not plant them as I knew very little about the plant. I didn’t know it was also called moonflower commonly which I have seen. I will give it a try in my garden but appreciate the cautions that it can become invasive and take over a space. I spent a big part of my working life trying to keep D. Stramonium (Jimsonweed) out of farmer’s crops and pastures. It is poisonous to humans and animals. It is interesting the Datura is of the tomato family. About the only familiarity is the size and shape of the seeds. I think this is one I’ll pass on. Between the toxicity, foul smelling foliage, possible skin irritation and spiky fruit…I don’t think I’d enjoy having this in my garden. This article really enforces that fact that we should learn the scientific name of plants that we are interested in, planning on purchasing (so we don’t buy the wrong one) and for our garden journals. The D. stramonium, which we can grow here in Wisconsin, is really lovely. But it is pretty scary to have around children and pets who sometimes don’t know better and it could potentially cause severe illness or even death. And it is deadly to livestock. This along with the fact that the foliage can smell bad and the sap can cause a rash on someone who is sensitive to it, I think I will pass on this plant. But very interesting article. Interesting.. I saw this plant in Utah but not in Wisconsin. I’m not sure I would plant it as it reminds me of Nightshade that I spend all summer pulling out! Well, now, this is one I have tried to grow. They did not thrive in my yard even though they had full sun and well drained soil. I think they are lovely and I really like the seed pods. I did not know they can be poisonous. Where can you buy seeds for this plant? A very interesting plant, with a night time fragrance, beautiful flowers and easy to grow! While my next door neighbor was awed by the number of sphinx moths present in her front yard this past summer, I was in awe of my first flourishing bed of “moonflowers”. It wasn’t until I read this article that I learned that the sphinx moth is the primary pollinator of “Datura”. I’m hoping to observe the actual pollinating of these gorgeous flowers this summer!